Lithium-Ion power tool batteries are one of the most popular types of rechargeable batteries for cordless power tools. Replacing the NiMH (nickel metal hydrid) battery, this carbon and highly reactive lithium alternative can be rapidly charged, making it the obvious choice for tradesman who are looking to get work done even quicker. Dewalt have since rolled out all of their new machines with only the Li-ion battery, as it can store a lot more energy and weighs significantly less. They are a brand who are notorious for being the first-to-market with new tools and technology, as well as continuously looking for ways to improve their existing ranges. There is a clear demand by professionals to use lighter and more compact tools without compromising on power. This is where Lithium-ion batteries make perfect sense, helping to reduce fatigue from the heavier NiMH predecessor. On every battery, you’ll notice an Ah rating, standing for ‘Ampere Hour’. There is a misconception around the run-time of these batteries equaling to 1 hour per 1.0Ah. Initially, a 1.0Ah did mean 1 hour of battery charge but this only applies when the current flow is 1A and there are no other differences. Nowadays, as the Ah changes and other variables are taken into consideration, such as the current draw of the machine and various working applications - the runtime changes. It’s best to use the logic that the more Ah - the more runtime. And with a heavy-duty tool like a jigsaw or circular saw, then a higher Ah is most certainly necessary. If you’re looking to operate cordless construction machinery, to get the longest runtime with these, we would recommend choosing from the dewalt flexvolt range. Each battery will have its’ own voltage. The voltage determines the level of power the battery can deliver. From this manufacturer, you can find various cordless drill batteries types such as: 10.8v, 18v and 54v. Light applications using just a small drill or screwdriver, may only require a low voltage battery like a 10.8v, whereas medium applications using powerful tools like impact drivers or hammer drills run best with dewalt 18v batteries 5.0ah or 4.0ah and for the highest level of power, suited to the toughest work, this is best executed again with the 54v. 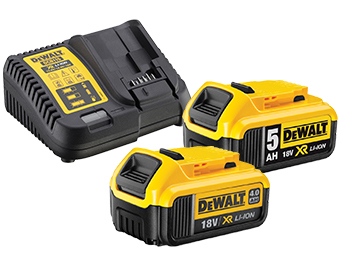 The 54v battery is almost exclusive to the dewalt brand. They were the first to introduce this product to the world of tools and have since built the largest range of heavy-duty equipment designed to run just off this single battery alone. Delivering a superior level of unprecedented power, the 54v battery is called ‘FlexVolt’, as it offers (the first of its kind), a backwards flexible voltage system – powering both the FlexVolt power tools and DeWalt’s core range of 18v XR cordless tools. Keeping your batteries topped-up makes complete business-sense to the busy tradesman. Time is money, and waiting for a battery to charge-up before you can continue on the job, is not the most efficient use of your day. Get organised before you start, stock up with plenty of batteries and charge these fully, ready for the working day ahead. Not all dewalt battery chargers work with every style of dewalt battery. Make sure you read the description, to get the right charger for your tool. If you have power tools with various voltages, then it’s best practice to invest in a multi-charger to cover all your bases. We offer a wide choice of chargers to suit different budgets. DIY enthusiasts can keep their costs reasonably low by working on light applications with low voltage tools. A 1.0ah single battery charger costs less than £30. Other chargers are available for single or multi-use. Of course, if you’re using the flexvolt range there is a designated charger to serve these batteries. If you’re a professional tradesman, it may even pay to invest in the flexvolt charger early on, like the battery itself, it’s a cross-compatible charger that can charge other voltages, including 18v XR batteries. In time, when you upgrade over to this level of power – you’ll have a suitable charger and won’t have to buy twice. So, if you need to replace your charger or battery, or perhaps you didn’t receive one with your tools, (all our body only machines come without each), then look no further. We stock an excellent range to back-up our cordless tool offering, so you can find everything you need, under one roof.